Inspired by the lowly slime and just a touch more edible, these meat-filled pastries have been selling like hotcakes. That's assuming, of course, that you prefer hotcakes that stare at you approvingly while you bite into their adorable, protein-rich faces. 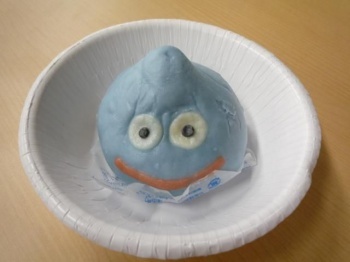 Commissioned in celebration of the 25th anniversary of the fan-favorite Dragon Quest roleplaying game series, these meat buns are a surprisingly accurate recreation of the slime. If you're unfamiliar with the slime, we congratulate you on your recent graduation from elementary school. Everyone else however, will recognize the cutesypoo lil' guys as the de facto mascot of the Dragon Quest games and the closest thing Japanese roleplaying games have to an ambassador this side of that spiky-haired jerk with the stupid-huge sword. Family Mart, the comfortingly-named Japanese convenience store chain that stocks the buns, recently announced that it had shipped one million of the things. Considering their sarcastically delicious appearance, that's a pretty impressive number made all the more impressive when you hear that the store hit that huge figure in only one week. Speaking as the mathematician that I certainly am not, that translates to daily sales of roughly "way, way too many." Why the apparent confusion over Japan's love for this confection? That picture at top is super-adorable, no? Yes, yes it is. Then you click over to Andriasang.com and notice the filling inside that shining, happy mug. I don't want to describe it as a "meat slurry," but that's only because I'm not actually positive that these meat buns contain anything that was once a living creature. If, after reading all of this, you suddenly find yourself hankerin' for a bit of ambiguously meaty RPG mascot, you'd better hurry. These buns are a limited edition item, and Family Mart claims that once the current stock has been snapped up by too-trusting Japanese consumers, they'll be gone for good.